After breakfast, Check-out from the Hotel drive to Haridwar. 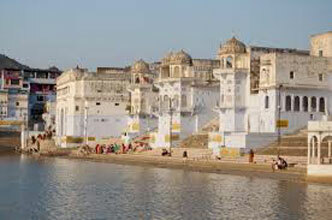 On arrival, visit Har-Ki-Pauri Ghat and attend the Evening Aarti at Haridwar. Resuming drive, arrive Rishikesh. Check-in Hotel. Overnight in Rishikesh. After breakfast, visit Haridwar. Mansa Devi Temple, Har-ki-Pauri, Sapt Rishi Ashram. Then visit Rishikesh. Bharat mandir, Rishikund, Laxman Jhula, Ram Jhula, Geeta Bhawan and Parmarth Niketan. Evening attend Ganga Aarti at Parmarth Niketan. Overnight in Rishikesh. Today post breakfast drive to Jaipur. 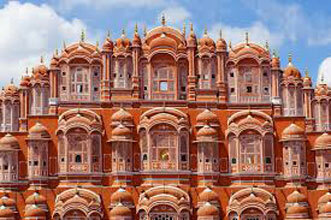 Arrive Jaipur by evening and transfer to hotel. This day free at leisure for shopping. Overnight at Hotel . Today after breakfast full days sightseeing in and around Jaipur beginning with Amber, the ancient capital of the region prior to Jaipur. Now a deserted complex crowning the crest of a hill with panoramic views, Amber Fort is extremely well preserved and a fascinating place to explore. Afternoon visit the opulent Maharaja's City Palace which occupies the heart of Jai Singh II’s city and has been home to the City’s rulers for 200 years. The Jantar Mantar or Observatory was built in 1728. Overnight at Hotel in Jaipur. Morning breakfast and drive to Agra. En route visiting Fatehpur Sikri - built by Emperor Akbar in 1569 and abandoned 15 years later due to severe water shortage- and now a World Heritage Monument. There are many magnificent structures within this city including the Halls of Public and Private Audiences- with stone column standing in the centre of the hall supporting a flat-topped throne. From the four corners of the building, there are stone bridges leading across the throne. The Panch Mahal or Five Storey Palace is a five storeyed building and the architecture- though Persian in style is similar to a Buddhist pagoda. Next visit adjoining Fatehpur- famous for its Buland Darwaza (of Towering Gate) and Sheikh Salim Chisti Dargah - the holy tomb of the famous Sufi saint who blessed Akbar with his only offspring and later Emperor Jahangir. Resuming drive to Agra. Arrive Agra and check-in at the hotel. Overnight at Hotel in Agra. 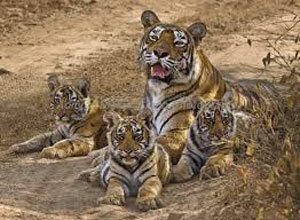 Post breakfast, visit for sightseeing of Agra . 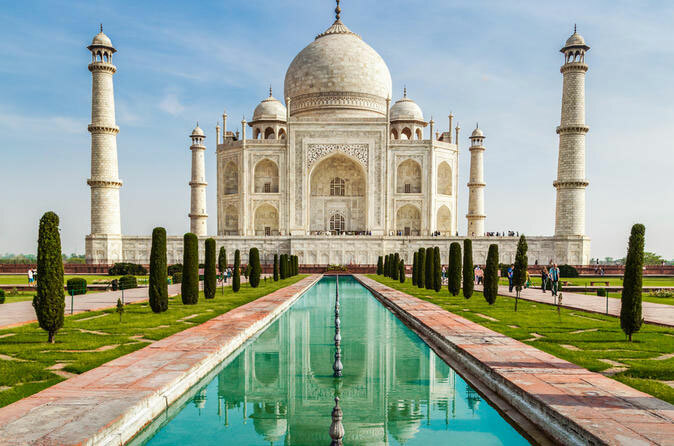 Start with The Taj Mahal (Closed on Fridays) - a monument of love from the Mughal Emperor Shāh Jahān which took 22 years to build and completed in 1653. 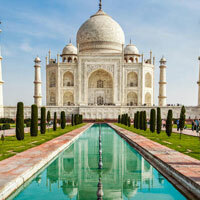 Situated on the banks of the River Yamuna, the Taj Mahal stands at the northern end of formal gardens. Later Check in Hotel. 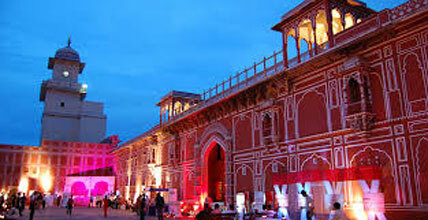 Visit the magnificent Agra Fort. 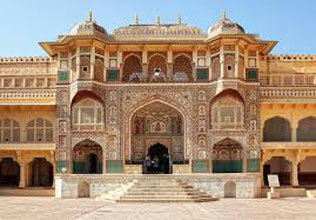 The Fort was built by Akbar in 1565 and further developed by successive generations. check-out and drive straight to Delhi airport for your flight to onward destination.